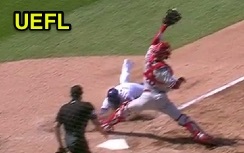 In this edition of Commentary Critique, we visit Chicago, where Replay Review overturned HP Umpire Nick Mahrley's call that Phillies catcher Andrew Knapp tagged out Albert Almora Jr., finding Knapp violated MLB's collision rule by blocking home plate without possession of the ball. Replay overturned an out call at home plate. The Play: With one out and the bases loaded, Cubs batter Anthony Rizzo hit a fly ball to Phillies left fielder Dylan Cozens, who threw home as Cubs baserunner R3 Almora tagged from third base, resulting in a play at the plate wherein Knapp tagged Almora prior to Almora's touch of home. The Call & Challenge: Initially ruled out by HP Umpire Mahrley, the ruling was overturned to safe as a result of a violation of Rule 6.01(i), which is the Official Baseball Rule for home plate collision abatement. Commentary Critique, Statement: During the Replay Review, Cubs television broadcasters Len Kasper and Jim Deshaies stated, "The catcher has the right to block the plate once he has the ball...and the baserunner in that instance has the right to hit the catcher," "There's no question the block impeded his ability to get there, which is only his job if the case where he already has the ball," and, "the block absolutely is the reason that he didn't score." Commentary Critique, QOC: This statement is mostly accurate (QOCY). Knapp illegally blocked the plate. Unless the catcher is in possession of the ball, the catcher cannot block the pathway of the runner as he is attempting to score. If, in the judgment of the umpire, the catcher without possession of the ball blocks the pathway of the runner, the umpire shall call or signal the runner safe. Not withstanding the above, it shall not be considered a violation of this Rule 6.01(i)(2) if the catcher blocks the pathway of the runner in a legitimate attempt to field the throw (e.g., in reaction to the direction, trajectory or the hop of the incoming throw, or in reaction to a throw that originates from a pitcher or drawn-in infielder). In addition, a catcher without possession of the ball shall not be adjudged to violate this Rule 6.01(i)(2) if the runner could have avoided the collision with the catcher (or other player covering home plate) by sliding. 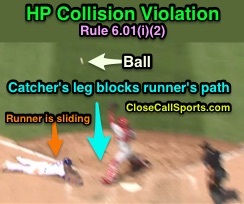 Rule 6.01(i)(2) Comment provides additional clarity: "A catcher shall not be deemed to have violated Rule 6.01(i)(2) unless he has both blocked the plate without possession the ball (or when not in a legitimate attempt to field the throw), and also hindered or impeded the progress of the runner attempting to score. A catcher shall not be deemed to have hindered or impeded the progress of the runner if, in the judgment of the umpire, the runner would have been called out notwithstanding the catcher having blocked the plate." HP collision is still legal in certain situations. Analysis: The catcher may legally block a runner's access to home plate under just four circumstances: 1) The catcher is in possession of the ball, 2) the catcher is not in possession of the ball, but blocks the runner's path in a legitimate attempt to field the throw, 3) a collision occurs, and the runner could have avoided the collision by sliding, or 4) the catcher without possession of the ball has not hindered or impeded the runner. Accordingly, a legal home plate collision may occur when a catcher blocks access to home plate and a runner opts to run into the catcher rather than attempting to avoid the collision by sliding, provided the runner has not deviated from his direct pathway to home plate for the purpose of initiating contact with the defensive player at home plate. Related Post: Little Home Plate Collision Begets Wrigley Bench Clearing (5/8/18). The Cubs previously were called for a violation of the catcher's home plate collision rule during the 2017 postseason, resulting in Manager Joe Maddon's ejection for arguing the Replay Official's decision that catcher Willson Contreras illegally blocked baserunner Charlie Culberson's pathway to home plate. As was the case with Knapp on Thursday, last October's call against Contreras also involved a catcher extending his leg in an attempt to block the runner from touching home plate. Catcher Knapp blocks the runner at home plate. 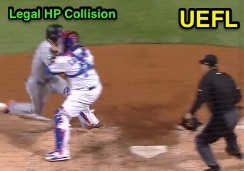 In this play, Knapp 1) does not have possession of the ball, 2) does not extend his leg in a legitimate attempt to field the throw (in other words, his leg position isn't part of a legitimate attempt to field a throw...the throw didn't take his leg into the runner), 3) the runner slid, and 4) the catcher impeded the runner by placing his leg/foot in the runner's pathway after the runner began to slide and before the catcher received the throw. With none of the four exemptions applicable to this play, it was properly overturned to a violation and the runner was permitted to score. Sidebar: Notice Crew Chief Jerry Layne signal the violation on review by kicking his lower leg.